duplicate names in a pedigree. You can input unlimited generations. 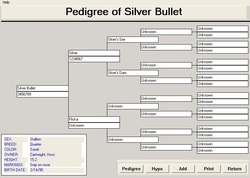 PedigreeBiz prints both pedigree and hypothetical mating. our small breeding operation on track. The record print outs really impress the buyers also! No questions about what has been done when to any horse on our property. I would recommend it to anyone with any size operation. As the owner of BHH Media and the Marketing Director at Performance Horse Digest, I see a myriad of products and programs for the horse industry. BHH Media helps our clients gain the competitive edge whether you are promoting a stallion, having a production sale, an auction, a professional clinician or trainer, or marketing your equine related products. 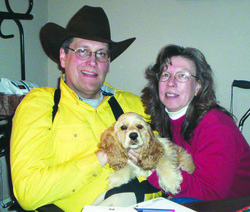 I see HorseBiz as a product that can help you also keep your competitive edge in managing your ranch.